This be a strange day. There was a strong wind blowing but we were surrounded by mists. Winds usually clear the mist. The only reason the mist could still persist is something blocking it from being blown away. Even a large island with huge mountains isn't big enough to stop the winds. All of a sudden, Nina started meowing very loudly. She must have sensed something. I asked the mates to reef and fold the sails. The ship must be brought to a stop. As the ship stopped, I heard a gentle thud near the bow. Did we hit ground? Firsty walked up to the bow and extended his hand out. "Gentlemen, we are facing a wall of ice." MRP or My Regular Place is another star from the Pritam Hospitality's stable. These are the same people behind ventures like Pritams Dhaba, Grandmama's Cafe and Please Don't Tell. 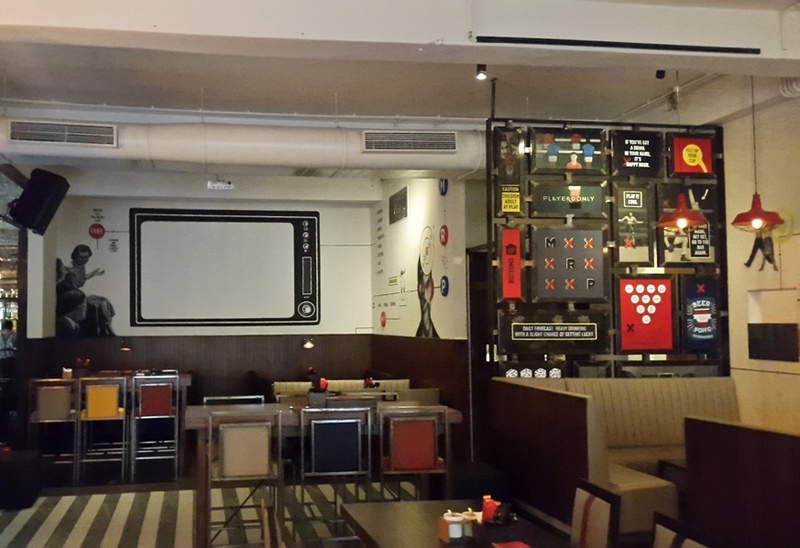 Located inside the group's star Hotel in Dadar east, this bistro promises 3G - Good Grog, grub and games. As opposed to the Cafe and pub kind of food in PDT and Grandmamas, MRP promises a fine dine experience. The restaurant is large, dim lit and has a party vibe to it. The bar is like an illuminated island. The decor is full of bar game themed artwork. The place offers many bar games like Jenga, Mini Foosball, Shoot the ball in cup, Uno etc. It even offers a giant Jenga which requires your muscles rather than your fingers. 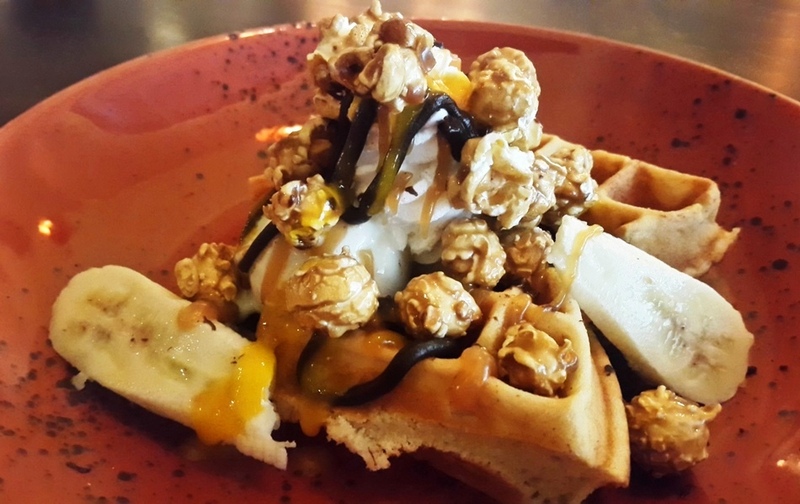 This makes the place a fun hangout for weekend binges. 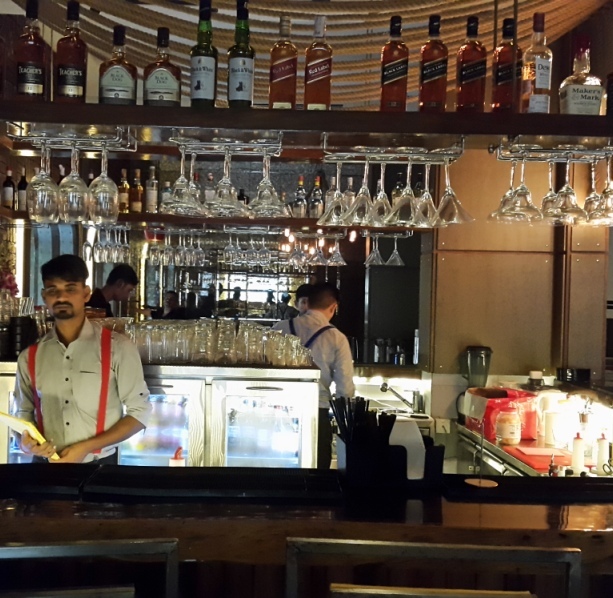 The restaurant is a bright star in the otherwise quiet and lackluster Dadar east neighborhood. I expect it to join the list of famous themed bars across Mumbai. The place offers good booze at cheap rates. Far lesser than most places of the same level. The variety is great but one must honor a place by trying its specialties. Japanese Onsen was a strong drink with salty and mildly sweet flavors. 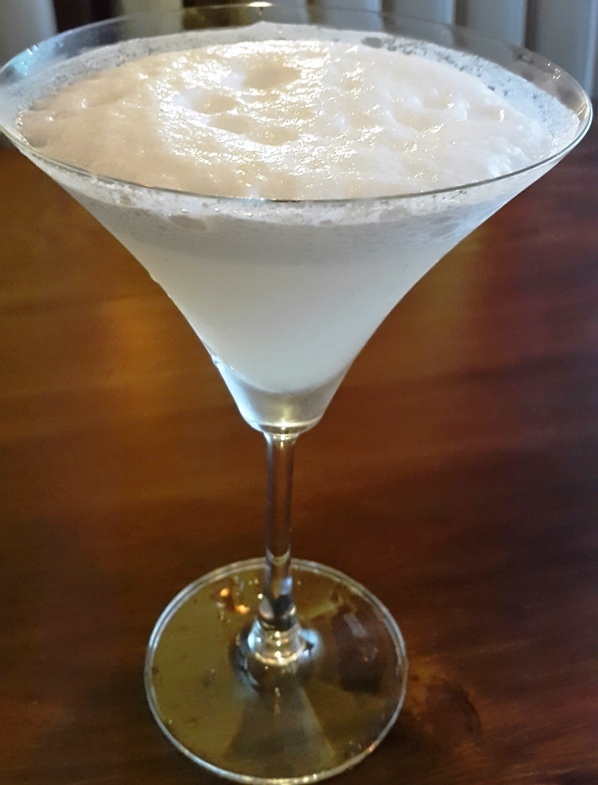 I somehow perceived myself standing near the sea during a rainstorm while having this drink. This was made by mixing Gari(Young ginger) infused Tequila, peach puree, lime and salt foam. The salty foam dominated the drink and gave the sea like feel to it. The other ingredients had more subtle effects and provided a bit of sweet and sour tones. I loved this mix. Captain : A wall? Lets break it and move ahead. First mate : That may be hard. For the wall to block the winds, it must be both large and thick. Navigator : We are stuck here until the fog lifts Captain. 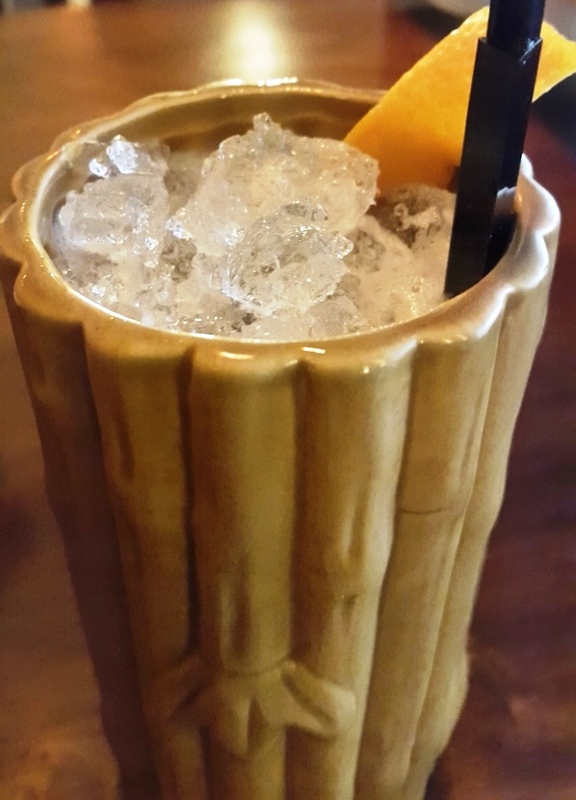 Tiki Torii was a candy like sweet drink with subtle bitter undertones to it. The flavor was excellent and the three Rums were mixed appropriately into the drink. Presence of cranberry and pineapple increased its sweetness. The only thing that peeved me about this drink was the large amount of ice. Though not as mesmerizing as the Onsen, this was still a decent drink. Sesame Ginger Chicken Dimsum was made with finely minced chicken in a thin dumpling wrapper. The taste felt slightly like curried chicken with subtle amounts of Ginger. The dumpling melted in my mouth. 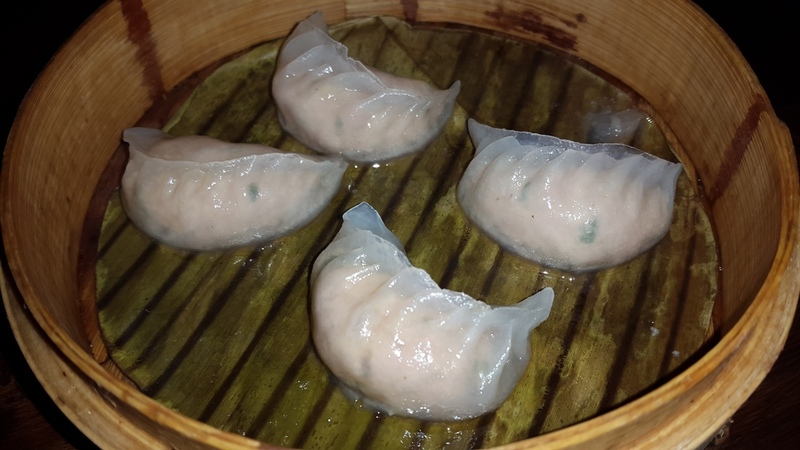 While not the best, this was a decent dimsum comparable to those found in most upscale Chinese restaurants. Prawns Ajilo was prawns soaked in a thin curry which contained Kaffir lime butter. The curry itself was delectable but the alchemy wasn't complete without the melt in your mouth soft Baos. 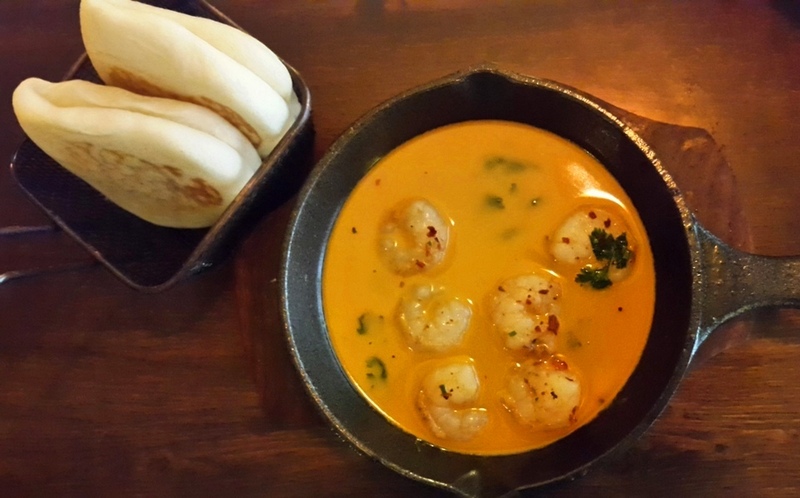 Stuff your prawns and curry into the Bao and have a bite of heavenly grub. The flavor pampered my taste buds. Easily the dish of the day. Captain : (Lifts Nina up) Love, you know a lot about this sea. Don't you? Captain : If only you could tell us how to get out of here. Quartermaster : Losing your marbles already mate? What will talking to a cat achieve? The Boneless Lamb shanks were a testament of the restaurant's fine dining caliber. These were tender delectable shanks which were juicy in every bite. These were well complimented with a side of kimchi flavored arborio. 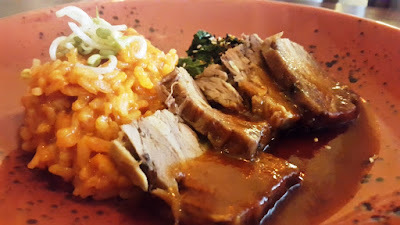 The meat was drizzled with Tamarind jus which added a zingy flavor to the savory base. The dish combined a lot of food cultures like Korean, Chinese and Italian. It is extremely pleasant to the palate. I would greatly recommend this to the reader. MRP's Lamb Shanks is one of the best lamb dishes that I have had till date. Drunken Chocolate Sundae was my second choice after my original choice deconstructed Cheesecake was not available. It was a mixture of Waffles, ice cream, a bit of mousse, chocolate syrup, Banana and Caramel sauces, Caramelized popcorn and Bailey's sauce. Was a good mixture though I felt that the caramel popcorn felt a bit harder than desired. Captain : What if the fog never lifts? We cannot leave ourselves to the weather's mercy. First mate : What do you suggest we do? Captain : Lower a dinghy, time to explore this part of the sea. Navigator : I wouldn't advise that Captain. You can get lost in the mists, plus we don't know what is in the water. Sharks? Kraken? Rabid News Anchors? The service was decent for the most part. My entire course was suggested by my server Akshay Kumar. Cool name right? The pricing felt easy for the drinks but on par for the grub with most pub and bistro like outlets. I would place MRP at a higher rank than most Pubs in town so I feel that the grub is well worth the moolah. MRP felt special because of its vibes, music and its offerings. For any person who calls themselves a gastronome of any measure, this place is MUST visit. Captain : Its night already. We wait till morning, after which we will have to find a way out. First mate : That I agree with. We don't want to die facing a wall. Gunner : If only we were a few paces away from the wall, I could have tried firing at it with the cannons. Engineer : If you fire at this close range, there is a good chance that ice shards from the wall would destroy the ship itself. Gunner : Yes, that is why I need the distance.